Making Time for What Really Matters. I never truly understood the importance of goal setting and writing your intentions down until last year. My goal was to leave my full-time job to start my own business, something I was thinking about for awhile. I would constantly hear it in my head and feel it in my heart that I was meant to do my own thing. I constantly dreamed about it but it's that moment I made a decision and started writing things down — that's when I started seeing some results and realizing the true possibilities. I wanted to be the creator of my life, not just manage it. 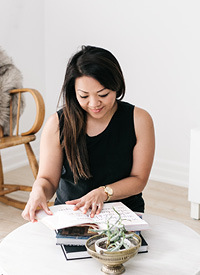 The Success Planner was created by Karlyn Percil, both a client and a good friend of mine. Our meeting was serendipitous; we hit it off instantly during a time when I was going through some inner struggles and our conversation just flowed. For those of you who know Karlyn, you'll understand when I say she pulls you in. It was instant comfort, our first conversation felt like one I have with my closest girlfriend. Don't you love it when that happens? We bonded over our passions and our mutual love for Robin Sharma. Karlyn has devoted her life to helping others face their fears in order to create a life filled with purpose and passion. She's even appeared on Oprah's Lifeclass numerous times! So when she asked me to help design a planner she was dreaming about, I was all in. It combines the proven strategies from thought leaders like Oprah, Tony Robbins, Arianna Huffington, Brené Brown, Robin Sharma and Napolean Hill. Trust me when I say, this isn't just a day planner, it's a roadmap to helping you achieve everything you want in life. My goal for this planner was to design something that was simple to use while also being minimal and beautiful. I really wanted to utilize a lot of white space. Space to let your goals take centre stage and to think about what really matters to you. I incorporated a different pattern every month, pulling textures from fashion and the patterns that Karlyn loves herself. This was truly a labour of love and both Karlyn and I put a lot of blood, sweat and tears (for reals) into this baby. And we do in fact, call it our baby. 3. what is your word for 2016? An all-encompassing theme or word that describes your goal for this year. Leave a comment on my Instagram photo what it is for your chance to win your very own copy. And that's it! The winner will be announced on Tuesday January 12th. Good luck! To order a copy of the planner, you can do so here.